Reviewed by Russell C on Nov 17 . I have used a lot of Bluetooth headsets, and I have pretty much hated every one I have ever stuck in my ear. I spend a lot of time in California in rental cars which forces me to use a Bluetooth headset. I frequently work outdoors in windy areas (I do consulting work for wind farms). I pair my headset with Dragon NaturallySpeaking Premium 13 which is makes audio quality very important. Bose is one of my least favorite brands. As you know from reading the website, I work very hard to find great values in products which often means avoiding the brands that charge a lot for being “brand name.” For example, I shy away from Apply products because there is a significant price premium associated with the Apple ecosystem. For this reason, I typically avoid brands like Monster and Bose as well. Sometimes, I have to put my stubbornness aside when I can't find a solution on the cheap. In the past, I don't think I have ever spent more than $50 on a Bluetooth headset, so it was a huge jump to go to a $150 headset. I made sure to keep all of the original packaging because I was sure that I would be sending it back once it disappointed me as well. To be honest, I didn't even really budget very well for this purchase because I didn't think I would be keeping it for long. I hate to admit this, but Bose proved me wrong about their brand and about Bluetooth headsets. Since buying the Bose Bluetooth Headset Series 2, my entire opinion on Bluetooth headsets has changed. I previously thought that these uncomfortable ear biters were only to be used for trips to California where I couldn't hold my phone to my ear. Since this new headset, I find myself using the earpiece all the time. Because I also use it for dictation, I find that I can walk anywhere in my office or hotel room while dictating with Dragon NaturallySpeaking Premium with nearly perfect results. Finally, I can hear! I have never been able to get the volume adequately high on a Bluetooth headset previously. This headset is loud and clear even with substantial road noise. The caller on the other end can hear me clearly. In fact, I have actually had callers tell me that they can't tell I'm using a headset. This is a significant improvement over past headsets when the caller would ask me to please switch back to my handset. The battery life is reasonable. I sometimes have to plug it in between calls on long trips, but I'm not complaining. The molded ear attachment looks strange, but it makes a noticeable difference. With past headsets, I have had to keep pushing the earpiece back into my ear when I get out of the car or move around. I haven't had any problems with this one. The call button interacts well with my Android phone, and I understand that it works well with iOS as well. 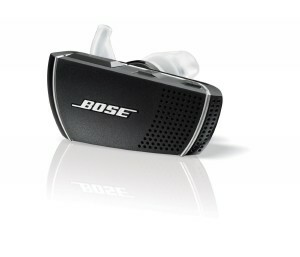 Given my success with this Bluetooth headset, I am going to be reconsidering buying Bose products again in the future. Overall, I am thoroughly impressed and would recommend this Bluetooth headset to anyone. If you're still trying to decide, go ahead and order this one. I'm not even wasting the time to write reviews of my other headsets. The Bose is in a class of its own. Worst case scenario, you can return it. I don't think you will.